Recyclable items are shown in this photo from the Ottumwa/Wapello County Solid Waste Commission website. The Iowa Department of Natural Resources introduced a new program in 2009 to encourage Iowa landfills to decrease the negative affects they have on the environmental. The Environmental Management System, or EMS, and its annual goals in six key areas of landfill management was seen as an alternative to relying simply on giving credits to landfills that serve as incentives for accepting fewer tons of garbage. But adoption of this approach has been slow. 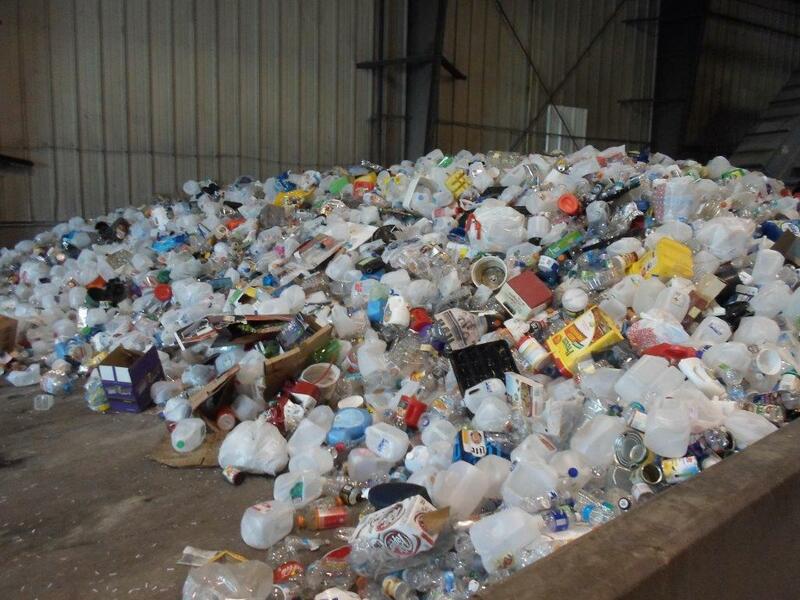 Three of every four landfills in Iowa do not use it. Reasons vary but a big one is the documentation that landfill operators have to deal with, interviews IowaWatch conducted show. Goals must be set annually instead of over a longer period of time, for example. Great River Regional Waste Authority, in Fort Madison. Landfill of North Iowa, in Clear Lake. Ottumwa/Wapello County Solid Waste Commission, in Ottumwa. West Central Iowa Solid Waste Management Association, in Carroll. The EMS program focuses on six targets: recycling services, greenhouse gas reduction, water quality improvement, yard waste and composting management, hazardous household waste management, and environmental education. Annual goal setting is designed for continuous improvement, proponents of the Environmental Management System said. DNR land quality bureau chief Alex Moon said those involved have found the more holistic and individualized approach to landfill management empowering. Jennifer Jordan, recycling coordinator for the Iowa City Landfill and Recycling Center, said the program gives her a chance to look regularly at how well the landfill is doing managing recyclable material. “I would say that the biggest difference between the system we used before was that that was a plan that we put in place and looked at every few years. This is really a living document that I look at every week,” Jordan said. 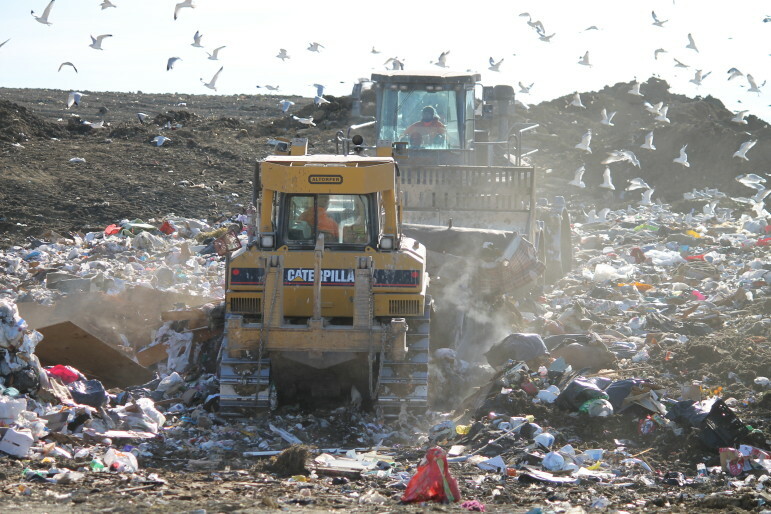 Interest in reducing what Iowans put in landfills is tied to the fact that the state’s 50 landfills took in 2.7 million tons of garbage in fiscal 2015, which ended June 30, 2015, and the most recent year for which data exists. Moreover, landfill operators are concerned about material that is dumped when it could have been recycled. An IowaWatch investigation reported in 2013 revealed that one-half to 75 percent, in some cases, of what Iowans toss into landfills could have been recycled, sparing landfills of methane emissions from decomposing garbage. It also revealed an oddity in how landfill-based recycling programs are funded in Iowa. Waste reduction and recycling programs receive most of their funding from a tonnage fee that the Iowa DNR collects from landfills. Under the Environmental Management System, the DNR reduces the fee landfills pay the state for each ton of refuse that enters a waste facility. The Scott Area Landfill, located near Davenport, is seen in this fall 2012 photo. Jordan said setting up initial documentation and paperwork for the program is a lot of work, especially for a small agency. “It would be a struggle for the first year or 18 months to get started in this but the benefits once they’re in the program are worth it,” she said. Iowans dumped 4.5 percent less garbage into landfills in fiscal 2015 than they did 15 years ago in fiscal 2000, Iowa Department of Natural Resources records IowaWatch analyzed show. Some landfills have closed during that time and others have taken more refuse on a regional basis. Cedar Rapids/Linn County Solid Waste Agency Site, 177,252 tons in fiscal 2015. Black Hawk County Sanitary Landfill, in Waterloo: 166,315 tons in fiscal 2015. The Scott Area Sanitary Landfill, Davenport: with 142,049 tons in fiscal 2015. Iowa Waste Systems Association (Mills County Landfill Association), with 127,528 tons in fiscal 2015. The DNR has been streamlining some of the necessary paperwork and updating its system so that participants aren’t sending in paperwork that is already on file, DNR program planner Leslie Goldsmith said. Even so, many landfill operators don’t see the Environmental Management System as working well for their agency. Hal Morton, executive director of the Des Moines County Regional Solid Waste Commission, said that agency is pursuing some of the same goals those using EMS are pursing. But, he said, the program’s logistics aren’t necessary for smaller organizations because operators at those organizations are able to communicate more easily among themselves than larger operations. Agencies that have adopted the program have pointed to a number of ways in which it has improved their function and affects on the environment. The Dubuque Metropolitan Solid Waste Agency, one of the original participants, recently expanded its recycling drop-off stations, started a collection program for bicycles that can be reused in the community, and built an education pavilion at the landfill. “I would say that EMS has helped us to reach goals and accomplish things that we hadn’t done before and probably wouldn’t have done without the EMS program,” Beverly Wagner, the Dubuque agency’s education and communication coordinator, said. This IowaWatch story was republished by The Des Moines Register, Iowa City Press-Citizen, The Courier (Waterloo-Cedar Falls), The Gazette (Cedar Rapids, IA), The Telegraph Herald (Dubuque, IA) and Waste Dive under IowaWatch’s mission of sharing stories with media partners. IowaWatch digital analyst/assistant editor Lauren Mills contributed to this report.